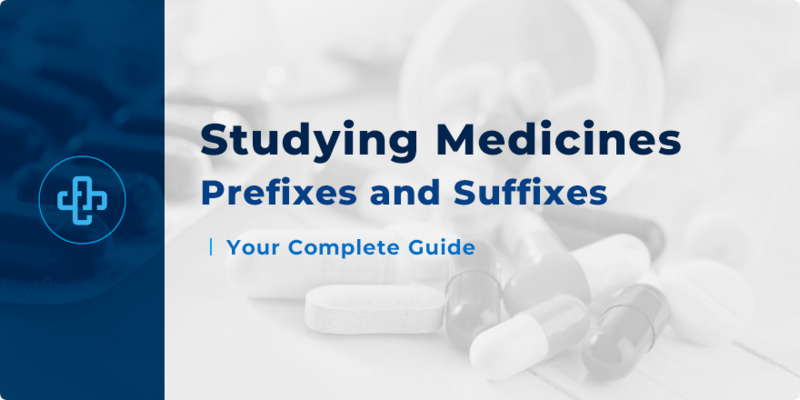 Medicine Prefixes and Suffixes | Your Complete Study Guide! When you first begin to study drugs, one thing hits you very, very quickly – namely, the sheer volume of drug names and categories that need to be committed to memory. In an earlier post, we reviewed some great techniques to memorize drug side effects. There, we learned how to categorize and compartmentalize our study – adding a defined structure that lets us study easier, quicker and more efficiently. We can do the same thing with medicine prefixes and suffixes. There are broad families of medicines which have either the same suffix, root or prefix. Even if we haven’t seen the medicine name before, we can infer what the medicine is used to treat and what mechanism of action it has. In fact, we can even infer what side effects and drug interactions the drug is likely to have. Take ACE inhibitors, for example. ACE inhibitors have the common suffix –pril. Examples include captopril, ramipril and perindopril. As a group, ACE inhibitors are associated with a distinct range of side effects – a persistent, dry cough being the most prominent example. Becoming familiar with drug prefixes and suffixes, then, opens up an enormous opportunity not only to commit drug classes and members to memory but also side effects and drug interactions, too. Below, we’ve tabulated many of the most commonly encountered medicine prefixes and suffixes; a great tool to aid your study of pharmacology. Check back to our pharmacy blog soon for even more great tips and tricks on how to commit drugs, their side effects and drug interactions, to memory. Also, subscribe to our newsletter today (you can find the form above). Alternatively, you can register with PharmaFactz today to gain instant access to hundreds of quiz questions, flashcards, infographics, tutorials and guides and much more – helping you prepare for your next pharmacology exam.